Many chefs prefer white shrimp because they have a clean, sweet taste with a classic shrimp flavor and firm texture. They are bluish-gray or greenish-gray when raw but turn pink when cooked. While all shrimp have more cholesterol than other types of seafood, they are lower in total and saturated fat than most meat and poultry. Dairyland Shrimp in Westby, Wisconsin, is the first indoor saltwater shrimp farm in the state, following the lead of several similar farms in Indiana, Iowa, Illinois and Minnesota. Dairyland uses indoor recirculating tanks and a self-sustaining system that uses a bacterial community to break down waste and maintain water quality. Water is reused in the system, minimizing the risk of disease. 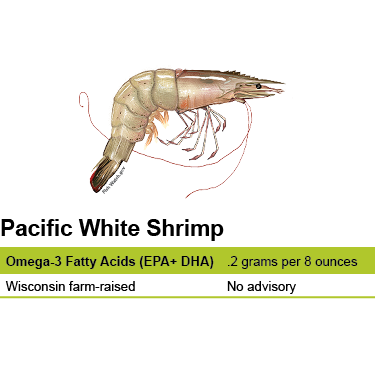 There is no consumption advisory for Wisconsin farm-raised shrimp. Pacific white shrimp (Penaeus vannamei) is a warm-water species native to the Eastern Pacific coast from Sonora, Mexico, through Central and South America as far south as Peru. It is a fast-growing shrimp that adapts well to a range of salinities. Shrimp is the most popular seafood in the United States; however, the majority of the shrimp eaten in the U.S. is imported from farms in Southeast Asia, Ecuador and Mexico. While the U.S. Food and Drug Administration (FDA) is responsible for ensuring that seafood imports are safe for U.S. consumers, the U.S. government cannot regulate the environmental impacts of international fish farms.